Won't someone do something about the liars? Just in case you deluded yourself into thinking Newfoundland politics had advanced in any meaningful way since the Smallwood era... it hasn't. From a January 25, 1969 CP wire report. Addressing the annual meeting of the Corner Brook Women’s Liberal Association, the premier said liars were responsible for reports that the Newfoundland government had asked the federal government to delay the start of a proposed national park at Bonne Bay for three years. A CP wire story about the lonely, unloved little caribou, clinging by its fingernails to the tundra and taiga of Labrador and northern Quebec. February 1992. A few months later, the commercial cod moratorium came into effect. Labrador native groups are accusing the Quebec and Newfoundland governments of dragging their feet as one of the world's largest caribou herds heads into a steep decline. "Nobody wants to be accountable, and meanwhile the finest herd in the world is disappearing," says Peter Penashue, president of the Innu Nation. "They're saying it's because of natural causes, but what if it's not?" The George River caribou herd, which ranges across northern Labrador and Quebec, has declined by 20 per cent since it reached a peak of more than 600,000 animals in the winter of 1987-88, says Stuart Luttich, a Newfoundland government biologist. There is only informal contact among biologists about the state of the herd, he said. "There's better communication between Alaska and the Yukon (about a herd in that region) than between Newfoundland and Quebec," Luttich said. "The informal contacts are operating on a very, very flimsy basis." The Newfoundland government places the blame on Quebec, saying that province walked away from discussions two years ago and has not returned to the table. "We have never said we were not willing to pursue joint management," says Jim Hancock, director of wildife management with the Newfoundland government. "It's in the best interest of both provinces to have a common plan, but there doesn't seem to be any commitment on the part of Quebec." Michel Crete, a Quebec government caribou specialist, confirmed his government is not interested in co-operation with Newfoundland over the George River herd. "There's no urgent need," he said. "The numbers (of caribou) are sufficient on both sides." And a regional wildlife director for northern Quebec cast doubts on warnings that the caribou population is in trouble. Claude Despatie says Quebec native hunters have not reported difficulties filling their quotas. A dozen Inuit commercial hunters in Labrador take about 1,500 animals a year, which are sold for their hides and meat. Another 5,500 animals are taken each year for personal use by natives and other licensed hunters. Up to 2,800 other caribou are lost from poaching and from shots that cripple but do not immediately kill. Biologists remain divided about the reasons for the recent caribou population decline. Dr. Fred Harrington, a biologist with Mount St. Vincent University in Halifax, believes the herd numbers follow a 60-year cycle and the population is now in a natural decline. But Luttich says that if Newfoundland and Quebec had set up a joint committee to oversee the herd _ as natives have asked _ the population may not have dropped so significantly. Native leaders say they remain powerless to do something about the slide in population as long as the political bickering continues. "We haven't been successful in getting the two provinces to talk," says Toby Anderson, land claims director for the Labrador Inuit Association. "We have the largest herd in the world and nobody cares." Since the Government Formerly Known As Provincial revived the Cult of Personality as a standard communications tool in July, nine releases have issued forth containing that immortal phrase, "Dunderdale Government". Of those nine, seven have come from the Department of Municipal Affairs. Which is kinda strange. During the entire WilliamsGovernment era, a grand total of 16, out of nearly 600 "Williams Government" releases, originated at Municipal Affairs. Sorted another way, however... the DComms who were by far and away most likely to be the lead contact on a "Williams Government" release were David Salter (85 releases), long-time flunky at the Williamsgovernmentiest department of all, Dansportation and Williams; Jacquelyn Howard (58); Elizabeth Matthews (52); and... Tansy Mundon, at 47 WilliamsGovernments to her score. Jacquelyn Howard is now Director of Strategic Communications, Planning and Priorities. And Tansy Mundon, whose WilliamsGovernment-fluffing career was mostly at Health, is now chief media fluffer at... Municipal Affairs. A plaintive cry from Chemical Tom, at 9:23 into the audio: "You're still not allowing me to follow through with my messaging, Randy." Imagine you are an alien, sent from another planet to observe the 2011 Newfoundland and Labrador provincial election. Hovering seven and a half miles above the surface of the earth just south of St. John's, your technology allows you to geographically visualize the results of the election, on a detailed poll-by-poll basis, by intercepting and scraping the data just as fast as it is reported by officials, to the news consortium on the surface. This is what your console would have shown you as the data streamed in from the capital and its suburbs. The harbour and downtown area are near the middle right of the image, with Bell Island at upper left. Your alien console shows each polling division, with the winning party, and the strength of its win, depicted using traditional colours. There are a few tied polls (shown in light grey), with no colour at all being draped over terrain that is either unpopulated or non-residential. And while some people might have wondered why there were so many dour Tory faces on election night, and in the days and weeks that followed — they won, after all — the view from 40,000 feet offers a few clues. 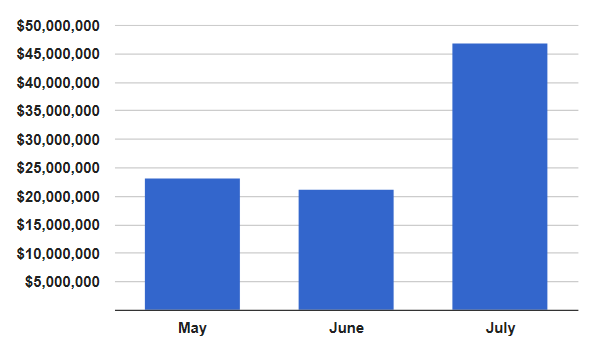 In May, the official DunderGov newswire carried 10 funding announcement press releases lauding a cumulative total of over $23-million in spending. In June, the total was 19 releases and $21.3-million. In July? Sixty-six releases for a total of just under $50-million. Going back to 2003, only last year — an election year — saw more money releases (75) during July than this July has. This has nothing, of course, to do with recent polls, nor with the fact that CRA will soon be in the field.